Today I'll be presenting deep thoughts. SUMMER FLICKS ARE HERE LADIES! Mr.Hemsworth [and his mitochondria] talk about his workout HERE. Bulking out excessively on heavy lifting made him 'blocky' and unable to move lithely, but provided the beef. However, switching it up to 'cardio and crossfit-style' workouts gave him the final movie form (listen at 1:33), fit that fancy Nordic warrior outfit and save Asgard and the world. Each ingredient in her recipe is a SUPER FOOD by all comparisons. Coconut flour is awesome stuff. Apparently it has great minerals, medium chain fatty acids and fiber. Fiber is good especially when it is lectin and phytic acid free (unlike legumes, raw nuts/seeds and wholebodydiseasegrains). Red VPO (virgin palm oil) is one of the most popular oils in the world -- rich in deep orange carotenoids, antioxidant tocotrienols, coenzyme Q10, stigmasterol/plant sterols (anti-rheumatic Wulzen factor) and both oleic acid and palmitic acid (yes you need both -- read Peter Hyperlipid THE HORROR NEVER ENDS). Onions, low carb, high protein -- these food factors make for great health and snacking. Onions and green onions are rich in sulfur and quercetin (if you don't have SIBO and can tolerate FODMAPs) which aid glutathione proteins to detox and keep toxins at bay. Excessive carbs glycosylate and sugar-coat organs -- the tomatoes are fantastic long-acting carbs without impacting BGs. High protein -- sustains growth, repair and regeneration. 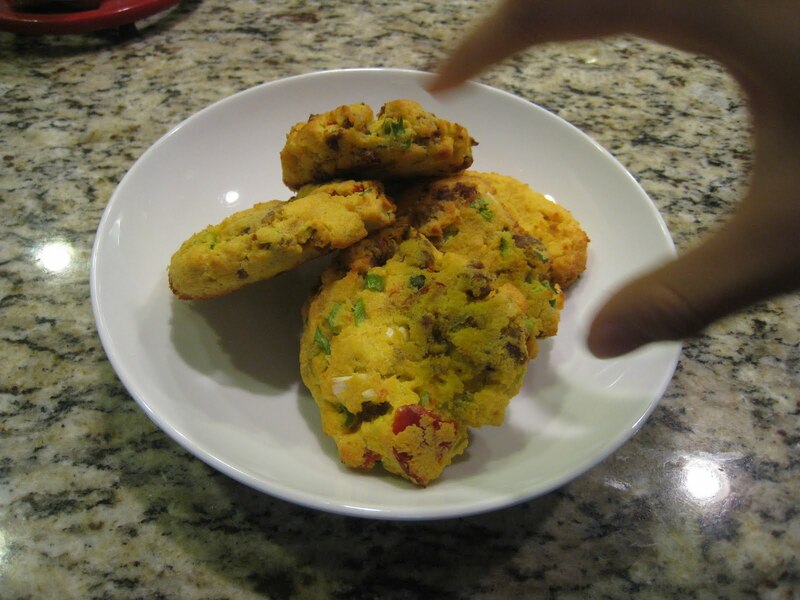 Sausage biscuits are one of the easiest to make vehicles for coconut flour and the other super foods. These keep for a while and are simply convenient to snack on and easily transportable (though somewhat crumbly if smashed). Coconut flour absorbs a lot of water from the air -- the eggs from the protein seal the moisture in but you may have to adjust the liquid in the recipe depending on your house humidity and other factors. 1/4 tsp. onion powder or grated onion, opt. Blend together eggs, oil, salt and onion. 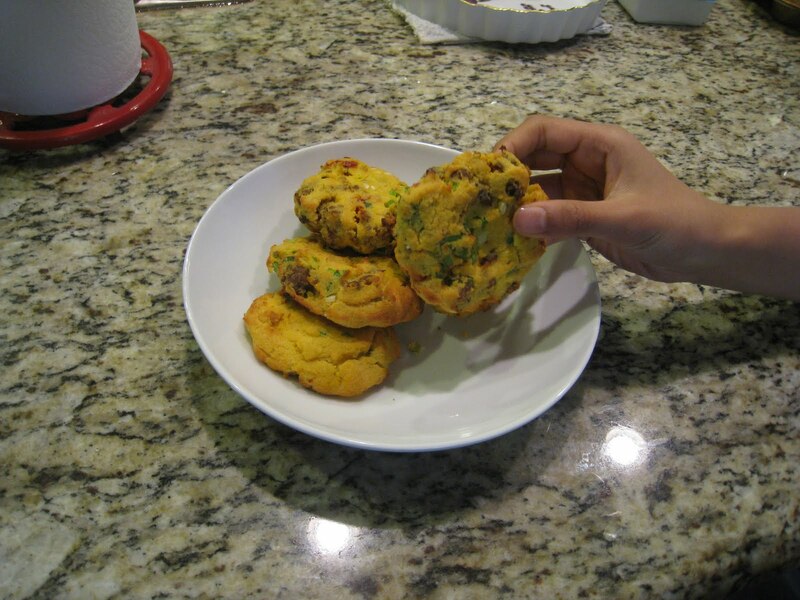 Combine coconut flour with baking soda and whisk into batter until there are no lumps. Fold in minced sundried tomatoes and sausage. Let the batter rest for 4-5 min to thicken. Drop batter by the spoonful onto greased cookie sheet (or use parchment paper), 2 in. apart. Bake at 400 degrees for 15 min. Stephan Guyenet PhD: Palm oil -- one study 69% reduction in oxLDL. Palm oil contains Coenzyme Q10, tocotrienols (family of vitamin E's). Expert Researcher Barry Tan PhD on carotenoids and tocotrienols in palm oil, interview and research articles. More history: Introduction: nutritional aspects of palm oil. Vitamin E tocotrienols improve insulin sensitivity through activating peroxisome proliferator-activated receptors. Fang F, Kang Z, Wong C.
Mol Nutr Food Res. 2010 Mar;54(3):345-52. Sachan DS, Yatim AM, Daily JW. J Am Coll Nutr. 2002 Jun;21(3):233-8. Leong XF, Aishah A, Nor Aini U, Das S, Jaarin K.
Arch Med Res. 2008 Aug;39(6):567-72. The effect of dietary red palm oil on the functional recovery of the ischaemic/reperfused isolated rat heart: the involvement of the PI3-kinase signaling pathway. Engelbrecht AM, Odendaal L, Du Toit EF, Kupai K, Csont T, Ferdinandy P, van Rooyen J.
Lipids Health Dis. 2009 May 29;8:18. Cardioprotection with palm oil tocotrienols: comparision of different isomers. Das S, Lekli I, Das M, Szabo G, Varadi J, Juhasz B, Bak I, Nesaretam K, Tosaki A, Powell SR, Das DK. Am J Physiol Heart Circ Physiol. 2008 Feb;294(2):H970-8. Dietary red palm oil supplementation reduces myocardial infarct size in an isolated perfused rat heart model. Bester DJ, Kupai K, Csont T, Szucs G, Csonka C, Esterhuyse AJ, Ferdinandy P, Van Rooyen J.
Lipids Health Dis. 2010 Jun 18;9:64. Sundram K, Hornstra G, von Houwelingen AC, Kester AD. Br J Nutr. 1992 Nov;68(3):677-92. Pereira TA, Sinniah R, Das NP. Biochem Med Metab Biol. 1990 Dec;44(3):207-17. Vega-López S, Ausman LM, Jalbert SM, Erkkilä AT, Lichtenstein AH. Palm oil and health: a case of manipulated perception and misuse of science. J Am Coll Nutr. 2010 Jun;29(3 Suppl):240S-244S.